In a small bowl, combine milk & hot sauce. In another small bowl, combine bread crumbs, paprika, and chili powder. Place chicken tenders under a sheet of wax paper and pound them flat. Cut each tender into 2 or 3 two-inch pieces. Place 1 tsp of blue cheese crumbles in the middle of each piece. Roll the chicken around the cheese. Dip each rolled chicken piece into the milk mixture and then into the bread crumb mixture, ensuring all sides are covered. Cook bites on a cookie sheet for 12-15 minutes. Cooking time will depend on the thickness of your chicken. Check your thickest piece to make sure they are cooked through. Spice up your next gathering with some blue-cheese-stuffed buffalo chicken bites. These blue-cheese-stuffed buffalo chicken bites are as tasty as restaurant-style wings, but can be eaten in the comfort of your own home. And without the pesky bones, I’d choose them over traditional wings any day. Buffalo chicken wings are traditionally a game-day food. But whether it’s March Madness or the season finale of “The Bachelor” that has you gathered in front of the TV, these bites make a perfect snack for noshing-while-viewing. They're also a great appetizer for any spring barbeques you attend. Here are the how-to deets. Preheat your oven to 350 degrees and gather up your ingredients. In a small bowl, combine milk & hot sauce. In another small bowl, combine Progresso bread crumbs, paprika, and chili powder. 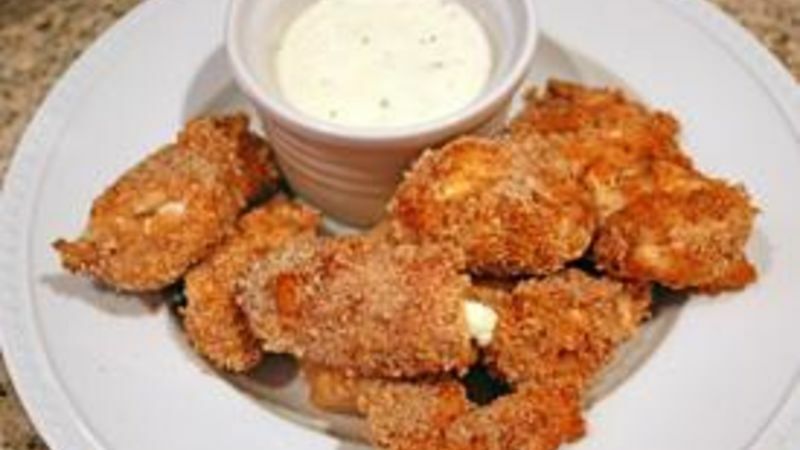 Place chicken tenders under a sheet of wax paper and pound them flat. Cut each tender into 2 or 3 two-inch pieces. Place a teaspoon of blue cheese crumbles in the middle of each piece. Roll the chicken around the cheese. Cook bites on a cookie sheet for 12-15 minutes. Cooking time will depend on the thickness of your chicken—so check your thickest piece to make sure they are cooked through. Finally, serve your bites with ranch or blue cheese dressing for dipping, and some cool celery sticks on the side. If you’re like me, you like to maximize your time in the kitchen. If I can get several meals out of a single cooking session, I am happy. Make a double batch of this recipe and use the leftover chicken to create a spicy dinner for the day after the party. My favorite use of leftovers is a buffalo chicken pizza. (Yum!) I chop the bites up, and use them to top precooked pizza dough along with sauce, red onions, scallions, and mozzarella cheese. What spicy ideas do you have for your leftovers?